The Community Resource Warehouse provides donated home furnishings to Catholic Charities clients and members of the surrounding community on a pay-what-you-can basis. Catholic Charities clients who are accessing services through any of our programs – particularly newly arrived refugee clients, veterans, victims of fire and victims of domestic violence – are given furniture free of charge. Located in the city of Camden, the warehouse is our first social enterprise venture. The sales of furniture to community members create revenue that is funneled directly into the warehouse’s operational costs. In this way we not only create a sustainable community service, we also put into practice our belief in the inherent dignity of purchasing items for oneself and one’s family. Why won’t you take my item? 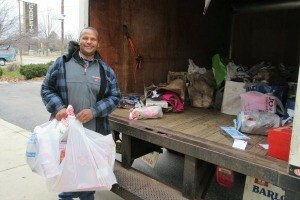 Unfortunately Catholic Charities is very limited in terms of storage and warehouse space. Therefore, we are often faced with the difficulty of turning away items that could potentially be put to good use in the future because we do not have the space to store the items. The Community Resource Warehouse program maintains constant contact with other programs within Catholic Charities to ascertain the immediate material needs of clients. Those are the items for which we first and foremost ensure adequate warehouse space. Gently used items refer to items that are not soiled, stained, torn, broken or ripped. While not brand new, items should be in good shape and typically only being replaced as a matter of a change in taste, not out of necessity. Gently used items are items that still look nice enough to offer to your neighbor. If your clients are in need, why are you only accepting “gently used” donations – isn’t something better than nothing? As Catholics we believe in the inherent dignity of every person and we are called to affirm that dignity in our words and our deeds. Our tradition teaches that every person is sacred and that those who are poor and vulnerable deserve special respect – this is called “Preferential Option for the Poor”. As a Catholic Agency, we take special care to ensure that the items we offer to our clients and the community members at large are items that they can be proud to own and will affirm their special place in the hearts of the Church. Thank you for considering a donation to the Community Services Warehouse! Before donating, please read our donations guidelines using the tab above. Self-delivery of donations is preferred. Call to make an appointment to deliver your items to the warehouse. For those residing in Camden County, donations of furniture and household items may be collected by pick-up twice a week. Contact us to schedule a pick-up. Second Saturday of the month, 8:30 a.m.-12:30 p.m. The Diocese covers six counties. Why won’t you travel to my county to pick up items if I live in the Diocese? Unfortunately, we only have one truck for the warehouse at the moment and the truck is based in the city of Camden. It is too costly (both in terms of staff resources and gas) to travel great distances to pick up a couple of items. However, if we are able to schedule several pickups in the same area, we may be able to make the trip cost-effective. Contact us and we will work with you.